Showing results for tags 'WizKids'. I went canon with this. No airbrush. It’s a great sculpt. Really it’s too bad Reaper would have to make a knock off version because of the IP. I bet they’d make a great remorhaz. In an effort to stave off "Dwarf Fatigue", figured I'd attempt something different alongside. Wizkids Female Rogues. I've painted these before for some coworkers, and found the one on the right to be extremely frustrating do to how the cloak hung. After some lurking about on the Wzkids thread it dawned on me to use the same "hot water/cold water" technique as for Bones on them. After a resounding "D'oh!" I did so and got good results. They've been hit with some watered down Sepia Wash, and I'm pretty sure I've gotten most of the mold lines. The color scheme I have in mind is the one on the left will be a recreation of the one I gifted to Eleven Coworker, as the sculpt is basically a mini me version of her, and the one on the right will be done in the style of the Dark Brotherhood of Skyrim as her daggers have kind of a Daedric vibe to them. Wizkids Female Barbarians. I haven't previously painted these and am currently undecided as to go with a series of browns/greys on them or if I should attempt to give a certain Stormcloak or Middenheimer vibe to them by adding blues in. Behold my works, ye Mighty, and despair! Since beholders destroy things that they look at ...it seemed fitting to adapt the title from Ozymandias by Percy Bysshe Shelley. I happened upon 2 beholders at my local game shop. The first was painted with a generic beholder color scheme and the second as Xanathar and Sylgar. Completed these in the past week or so. Wanted the Dire Wolf's fur to look unnatural; the quality of this particular Wizkids sculpt wasn't as good as I've experienced with the few others I've painted. The Bones Black Owlbear was a pleasure to paint; mostly just washes and dry-brushing. I've noticed that oftentimes people paint the pupils on owlbears to be too large, much like an actual owl. 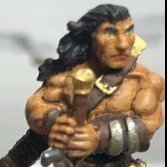 I've found that this diminishes the 'ferocity and scariness' of the owlbear by making it look more surprised. A couple of my players/friends gave me this and a gelatinous cube for Christmas and said, "Please don't kill us!" So hopefully he won't smush their characters too much! I wanted to give him a little bit of color so I did some purple and pink on some of the leaves as well as bright mushrooms. I used a few tufts of foliage and moss on him. I didn't want to overdo it and cover too much of the figure. I like how he came out. I finished a number of random miniatures up this past week or so and thought I'd throw them on here as a batch of bad guys. First up is this killer rabbit from Skull and Crown. This is from their recent kickstarter for bunnies from the margins of medieval manuscripts. This is the 3rd one of these I've painted and I'm still trying to find a scheme I like. But that's ok because I went in for a rather large group of these guys so I'm sure I'll come up with something good before I run out of them. Next up are an Oldhammer goblin from Impact and a barrel mimic from Wizkids. Don't know why, but they seemed like they'd enjoy one another's company while I was painting them up. And finally, here's one of the ogres from bones 3 (77455). My group has already run into a pack of ogres from that kickstarter and narrowly survived. What they don't know is I have a second set. So next time they run into a pack of ogres it will be twice as big. I'm certain they will appreciate that. I also finished the green head on a certain 5 headed dragon. But that's still a long way from being complete. I painted the Bones Black, Bones, and Wizkids owlbears as Great Horned Owls. This is the Wizkids owlbear. When you put the three together, they make a crazy singing group! I just can't look at tree creatures and think of them as evil or dangerous. Too many good memories of favorite trees. When I was given this mini the first thing I thought of was something along the lines of "that would be a fun place for a swing." I do want to throw this in a game though, and because no one wants to roleplay "let's all take turns on the mobile playground," I made it so the mousling comes off. This almost became a shelf of shame miniature. It's been on my workbench, pretty much finished, since early January. I just couldn't decide on a good way to attach its little friend. I don't care much for the pipe cleaner arrangement, but until I come up with something better, it works. He's going to make an appearance in a game this weekend where he'll try and eat someone. But then it's off to the Kingdom of Mousdom (my wife's desk at work) where I'm sure he'll get covered in other little mouse friends. Here is my take on the Red Dragon. This ended up being quite a bit more challenging than I first anticipated. Good practice for February. I can’t wait to get started! As always C&C are more than welcome! I finally finished painting my vardo. It isn't traditional colors but I think it looks fine for a gnome bard to live in! The model itself came out of the package a bit warped. Not sure what happened to it. Anyway, I used some of my favorite colors to paint it up. I have a few pieces I recently acquired, and intend to get a villagers pack that has more. Starting with the deep cuts barrels. 1 oak, 1 mahogany, 1 intense leather? Hello, it's been a while. Have some picspam. So yeah, been a long time. I had actually quit painting for some time. 5 or 6 years at least. I had a few false starts getting back in to to the hobby in that time. But yeah, pretty much the last several years, my brushes were dry, and my paints were unopened. Flash-forward to this past August, and I kinda got the itch again. 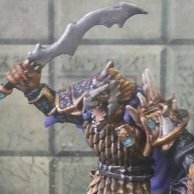 The minis in the Nolzur's Marvelous Minis line for D&D really caught my notice and got me pretty excited. So, I bought a few, got my brushes wet again and, well, the picspam speaks for itself, I think. I have some success, some not quite as successful, but, lots of finished output since August. Also pictured: a WIP of a Blightfang mini I received as a gift a few days ago. It's nice to be painting again. https://wizkids.com/...games-workshop/ Pretty much what it says on the tin. I'd be pretty shocked to see GW allow Wizkids to produce miniatures, unless they're way out of scale with GW's stuff, but it'll be interesting to see what kind of board games they come up with. I'm also wondering if they're not looking for someone to take the place of the recently expired partnership with Fantasy Flight Games. The TerrainCrate set I got included a heap of Abandoned Mine stuff, including mine carts, mine cart tracks, pickaxes and shovels, Big Glowy Crystals, crates, barrels, debris, and some dynamite kegs. I'm introducing this to my Weird West game as the Lost Mines of Joaquin Carrasquillo. Joaquin (played by 50319, Olaf, Dwarf Gambler) knows *where* his mining concern is, but has recently lost control of it. Dug too greedily...an' too deep. Awoke summat dark down there, forgotten by th' people of the world above. (It's Grab-oids with the serial numbers filed off.) Anyway, there's a lot of stuff to paint and here's the first installment! Tracks, mine carts, and equipment. The Crate came with three of each mining miniature. I gave the three mine carts slightly different colors (Rough Iron, cheap Gunmetal Grey, and a 50/50 mix of black and metallic pearl), and will probably rust the hell out of one of them. Two loads of coal; I'll need to do some research into silver ore before I paint the third cartload. Rack of mining equipment (needs a touchup and I should paint the lantern glass; also need to wash the wood with something dark) and a bunch of tracks! These probably would have benefited from a more patient man doing the painting. There are a LOT of track pieces--at least six of each straight track bit and three each of the others. I don't think I'll revisit the creosote ties, but I might rust up some of those rails. Typhus Corrosion and a bit of reddish brown, at least. The Crate also came with a set of Dungeon Traps, which included this beautiful mad-science Big Chunky Switch. It seemed like exactly the sort of thing adventurers in an out-of-control mine cart barrelling towards an intersection might have to lasso/shoot so as to switch tracks from Certain Horrible Doom to Possible Unspecified Doom. Ever since I was a kid, I've been crazy about Dinosaurs. I'm probably underselling that a bit. Regardless, my love for the creatures has carried over into adulthood. So, when Wizkids previewed this I was...apprehensive. Their preview image was taken at a less than flattering angle that really didn't show much of thw mini. Then they showed up in stores and sure enough, the "mini" pretty much rules. T-Rex has always been my favorite. Especially in a fantasy context. I was always amused when reading those old Marvel Conan comics when Conan and his sidekicks were harrowed by a dragon and the reveal of said "dragon" was actually a Tyrannosaurus. Anyway, I've never had the opportunity to paint many Dinos since I took up this hobby. And I usually didn't like what options were out there. I'm really grateful that Wizkids released something cool AND affordable. The elusive WizKids Beholder. Love this guy. Ok! The last weekend of my last show of 2018 is coming up, and the weather is turning cold, so I will have neither script nor sun to keep me from my desk during lunch. Which means I'll be painting! As I did last year, I'll be keeping a series of WiP threads for my lunch session projects. First up on the docket this year are three minis that are *this* close to being done already. The first was my test for plaid for one of my lunch session threads last year. She's a Wizkids barmaid, and she just had a few finishing touches: Also in the batch is another leftover from an old WiP, the Ral Partha Couatl. Mostly I just need to do the base on this one, but some touching up is necessary on the wings as well. And finally is a modification of Reaper's Veronica Blaze. I swapped her weapons for lightsabers and gave her lekku a very long time ago, at least eight years. But this Jedi Twi'lek is ready for some quick and dirty OSL so I can call her done. Here's the checklist of stuff for each. Back from Reapercon and working on the little's PC for our inconsistent dnd game. She's super tiny but I really like the sculpt. Gripes about plastic, and the mould quality though. It's a wizkids preprimed number. I wish they did these in metal. She's coming along nicely. Her skins are the rosy skin triad with some of the fair skins mixed in. Hair is intense brown, vmc orange brown pumpkin orange and then pumpkin orange and rosy highlight, then tiny bits of rosy highlight. Her eyes are I think leaf green, and tiny. Kiddo is requesting some purple socks with stripes so that is the next thing. Enjoy:). This is the beholder from Wizkids. He is my first completed mini for Saturated Seotember where I am going to try and spend some time painting every day for the month of September. I have a WIP thread going if anyone wants to follow along or join in! He got a little more orange than I intended but I don't mind how he turned out. I want to get my hands on another one and greenstuff his eye to make a different (round) iris and pupil. Fun mini to paint. We'll have to see how my players like him! These were a quick and easy paint, and I went for a realistic tone to match the sculpts. The victim pile is supposed to be a base element for them, but I decided to keep it seperate as a scenery piece. The shinyness on the fellow in the back is due to the black wash not being entirely dry when I took the pic. These guys took a bit more time than I expected, but I'm happy with the overall results. The one on the left was inspired by Manfred Von Carstein and the other by Vlad Von Carstein. I chose Not Manfred's colors with "Vampire Wizard" in mind, but he kind of resembles a French noble during the Terror fleeing from the guillotine. The renders on the back of the blister showed various detail on the clothing and I tried to emulate that in gold. Lunging at prey, casting Hand of Dust, or does he just talk with his hands? On Not Vlad, I did the details in silver, as I was going for "Classic Vampire" style with him. I tried to freehand a bit of detail onto the sheath, but the blade was too thin to really do much. It works from a distance though. About to show those meddling kids that when he says "Get off my lawn! ", he means it.